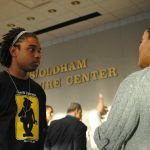 The Mizzou Black Men’s Initiative (MBMI) is a GOBCC program aimed at increasing the retention and graduation rates of young Black males at the University of of Missouri. As an interactive leadership and personal development program, the MBMI provides academic and social support for its participants. The MBMI program aims to foster a proactive environment for leadership and success through the utilization of leadership training, conferences, guest speakers, workshops, social activities and more. The MBMI is made up of two phases. Phase I is our freshmen initiative which primarily serves as a transitional component for our freshmen males into college. Phase II is a continuation of the first phase but operates as a student organization for Sophomores and up. Phase II focuses on mentorship and continues to build upon the principles of academic, social and community leadership established in Phase I. Both phases are united and operate as a brotherhood amongst Black men.